10 August 2016, Malaysia – In reaching out to Asian women and their families aspiring for premium lifestyles, Panasonic Appliances Asia Pacific, the regional consumer marketing arm of Panasonic, has launched the ASPIRE Project. 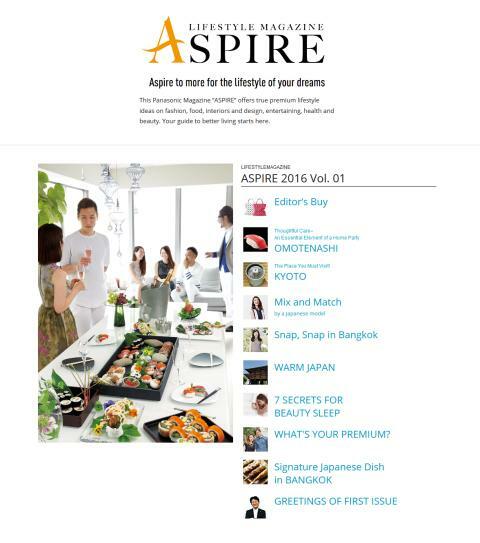 To kick start the project, the company will roll out the quarterly ASPIRE lifestyle magazine and website today, which aim to bring the Panasonic brand closer to consumers by sharing interesting facets of the Japanese culture, useful lifestyle tips and what goes behind the company’s product development. Southeast Asia is said to be one of the world’s most promising economies, given its rapid social and economic developments. As its urban population expands, disposable income and demand for premium consumer goods also increase. Aspirations and expectations of women and their families have evolved. “One of Panasonic’s business philosophies is to create products that improve living standards and contribute towards a better life, a better world. With ASPIRE, customers can find information on our products and insights on ‘premium lifestyles’ in general,” said Hiroyuki Tagishi, Managing Director, Panasonic Appliances Asia Pacific. 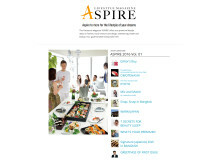 ASPIRE contains articles ranging from fashion, cuisine, living, beauty, health, and entertainment. At the centre is Panasonic suite of ‘premium lifestyle’ products such as televisions which brings Hollywood Picture Quality to the comfort of homes and refrigerators that allows for no thawing, easy-to-cut fresh food, thereby saving cooking time. Japanese concepts such as ‘Omotenashi' (cordial hospitality) and ‘Kodawari’ (seeking excellent products) are also introduced in the first issue to give customers insight into the culture on which the Panasonic Group Companies was built upon. Panasonic Appliances Asia Pacific was established in April 2015 to boost the home appliance business and raise Panasonic brand value in the consumer electronics sphere within Southeast Asia and Pacific countries. Based in Malaysia, the company functions as an umbrella organisation for product development, manufacturing, and marketing in the APAC region.